I am busy with a side project on award equivalences, and would appreciate some help from the gents in the know. The idea is to have a list of awards based on the actions needed to earn them, split by nation. As example: if an act of bravery in the Wehrmacht got you an Iron Cross 2nd class, what would the equivalent US or UK award be (I have the Bronze Star with Valour Device, and Military Medal in this case)? 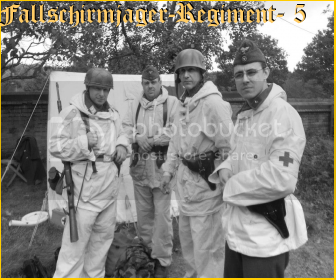 So, regarding German medics: what would be their equivalent (roughly) of the US Combat Medical Badge (http://en.wikipedia.org/wiki/Combat_Medical_Badge)? A Sani is a soldier first, medic second. i've researched them quite alot, ive seen shed loads of fallsy sani's highly decorated. Hope this helps.